February has been off to a great start between heading to Chicago for a blogging conference, Galentine's Day get togethers, and lots of wedding planning (..did someone say cupcakes?). I thought I'd check in and share a few of the things I'm loving most at this very moment. I've been doing lots of reading about "slow living" (this is a great intro) and it's a concept I'm putting some major focus on- enjoying small moments, stressing less, and practicing better work/life balance. So, I'm taking the time to share a peek at this very moment & what I can't get enough of this month. - Why Not Me- Mindy Kaling: Mindy is hilarious and her book is no different. It's an over the top but relatable collection of personal essays that highlight "adulting" at its finest. - Blue China Saucer: This was a thrifting find from a couple of years ago and it's served many purposes- currently it sits on my desk as a fancy coaster for my coffee. -Stoneware Pottery Mug: I picked this up over the summer at Madison's Art Fair off the Square, handmade by a student artist and perfect for cozy evenings. - Rishi Jasmine Tea: I sampled some tea from local Rishi Tea during my Visit Milwaukee trip. It's organic, smells heavenly, and you can see the tea brewing in a knit tea bag. - P.F. Candle Co: My sister gave us all San Francisco goodies for Christmas including P.F. Candle Co candles- handpoured in California! I love the sweet grapefruit scent. - Kendra Scott Elle Earrings: I've become more minimalist with my accessories lately (though still can't resist a good arm party!). These earrings have become my go-to; I want them in every color! 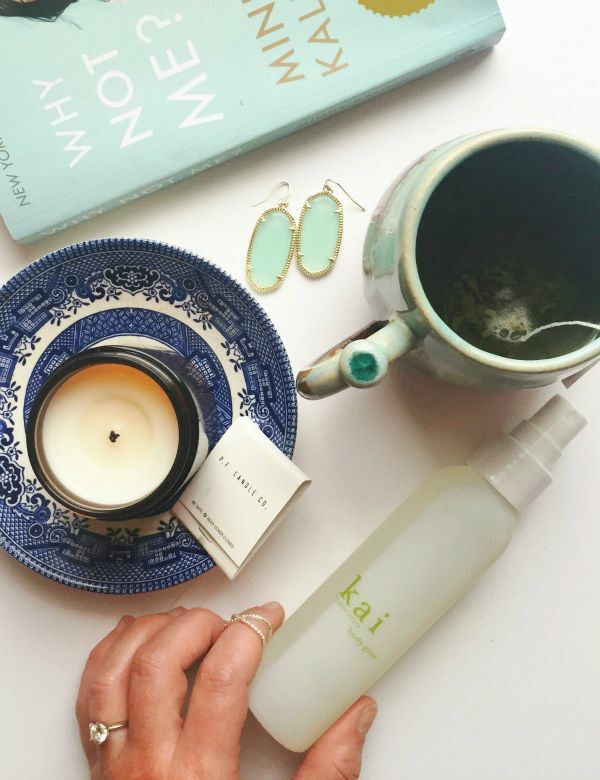 - KAI Body Glow: I tried this dry oil at a boutique when were in Maui and instantly wished I had bought it after I got home. Thankfully, I was able to track some down stateside. It smells absolutely amazing, exactly like you'd envision Hawaii to be! It reminds me of our engagement. - Midi Rings: I love layering these up with other rings. Kohl's has an awesome selection from the Lauren Conrad collection that are fun to mix and match with. Love all of these Lauren!! That blue china plate is so pretty -- I kind of want to host a tea party just so I have to get something like that!! :) Hope you are doing well and I'm sad I missed you at the Windy City Blogger conference!